Back away from the Reese's egg. This is way better and super easy!! 62% cacao dark chocolate, 1 ingredient peanut butter, pb2, cinnamon "Reese's"!" Back away from the Reese's egg. This is way better and super easy!! Mix 6 tbs of prepped pb2 with 6 tbs of natural peanut butter. Melt the package of cacao dark chocolate chunks (I put them in a bowl over a pot of boiling water and constantly stirred). 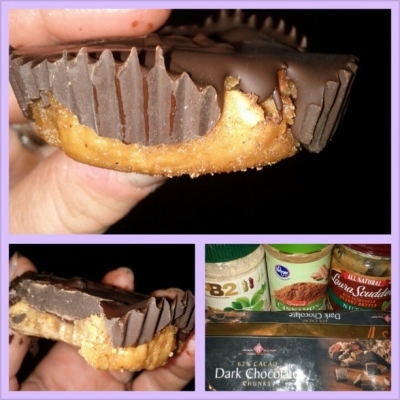 In a muffin tin with a liner put a tbs of the pb2/peanut butter mix and sprinkle with cinnamon then cover with a tbs of the melted chocolate. Repeat for all 12 of the muffin liners and freeze for an hour or so! !